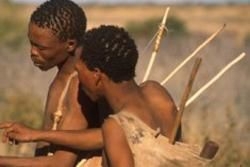 True to the word San, meaning "gatherer", the nomadic Bushmen are one of Namibia’s most intriguing populations. Thriving in the seemingly inhospitable Kalahari Desert, the San are as adapted as their animal counterparts. The basis of their survival is knowing where to search for water as well living in harmony off the land by hunting and gathering desert melons and palatable berries, everything they utilize is done with immense respect to their environment. The children of the desert communicate with a language comprised of complicated clicking sounds and construct their homes by weaving together grass of the Stipagrostis family, aptly named bushman grass. A few lodges in the area provide guests with the unique prospect of experiencing the Bushman culture as well as the ways in which they survive off the land.